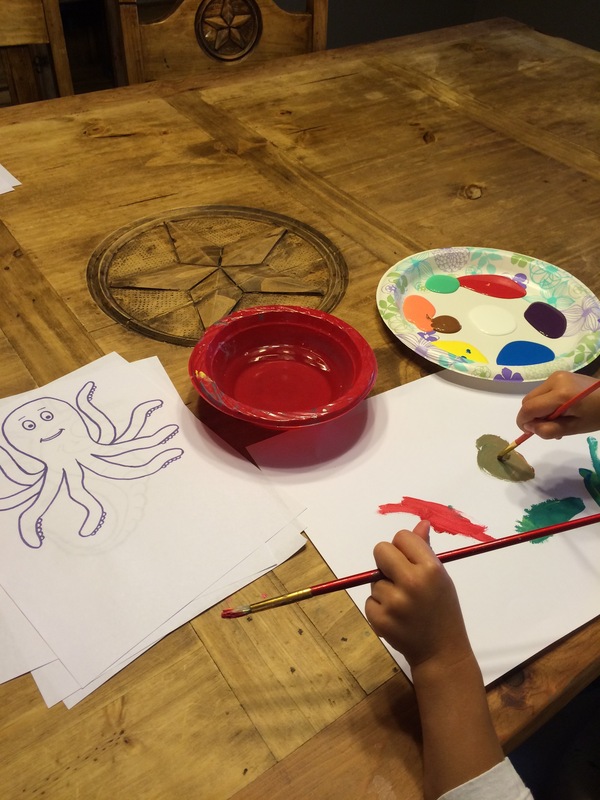 Under the sea is all about sea creatures in this house. I always love letting my little ones create. Even though the mess at the end is massive, the smiles on their faces are well worth it. I have decided to to join Mama VS. Teacher with her brand new linky #imaginationmatters ~ all about creativity and imagination with your kids. I think it’s an excellent idea and can’t wait to do each week’s challenge. Below is a list of the activities if you wish to join. I decided to print out some coloring pages with all kinds of sea creatures and let them paint instead of color the pages. I also found some googly eyeballs in one of the art boxes and so I poured them on the table and let them glue them after the pages had dried. I am pretty sure my printer is about out of ink now after printing 3 pages per creature and they kept wanting more. 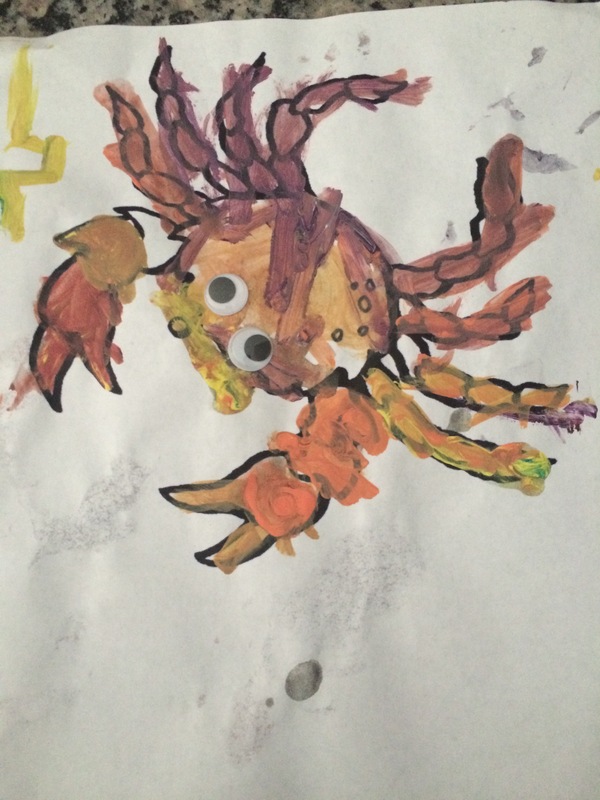 This was Monster M, age 4, and her crab. 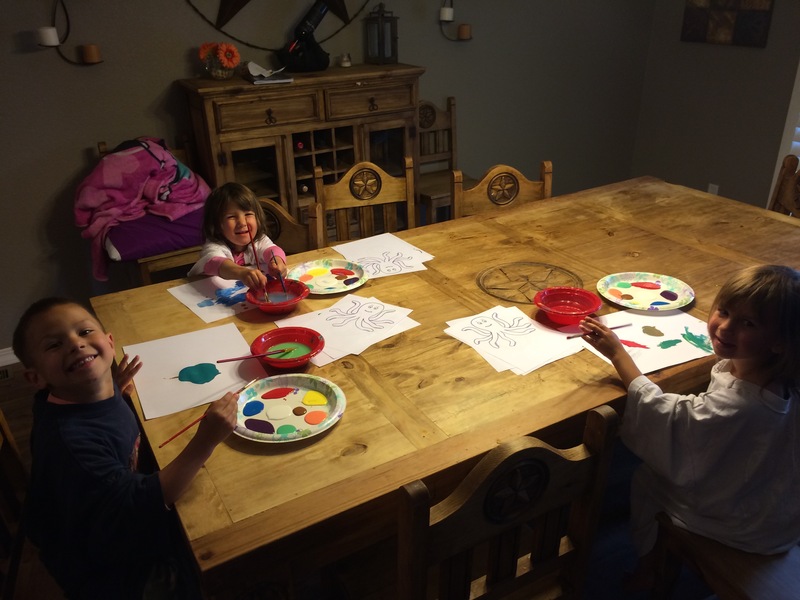 At first she wanted to just make a huge mess with the paint but once she realized her brother and sister were creating masterpieces, she too wanted to join in. 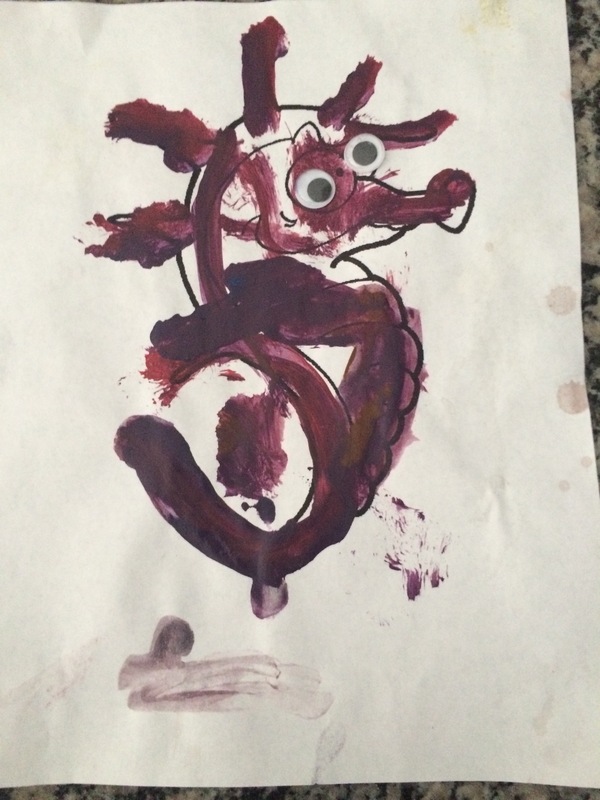 Believe it or not this was created by my 3 year old, Monster Z. She even glued the eyes on by herself with no help from Momster. 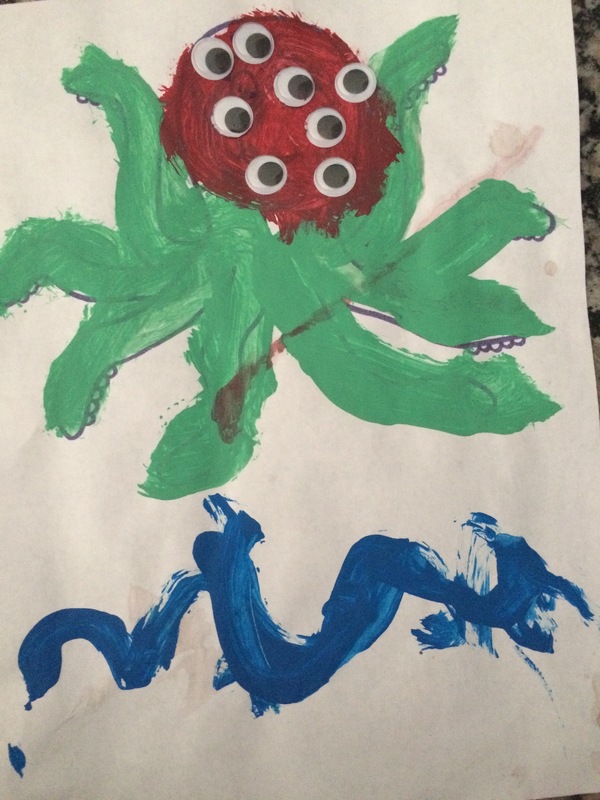 Monster B Man’s idea that the octopus had to have as many eyes as it does tentacles. I usually put down wrapping paper or plain brown packing paper when they paint but I was fresh out of it this day and had already told them that we would do some painting. Needless to say, the table now has some new added color to it. I think it is so important to let our kids be creative and use imagination. Who cares if they color a tree blue or put 8 eyeballs on the Octopus. I love any form of art and I am always encouraging my mini monsters to find their own way of loving it as well. Ooo, I love it! The seahorse is particularly amazing and I adore the eyes! You have a lovely table as well! 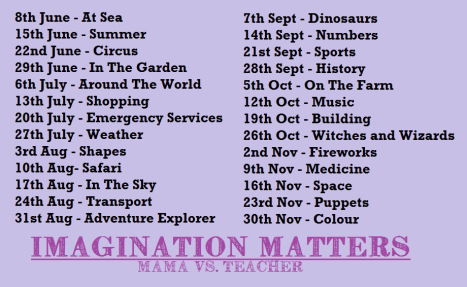 Thanks for linking up to #imaginationmatters and I can’t wait to see what you have next week! Thank you so much for hosting. It’s a fabulous idea for a linky. So much fun! 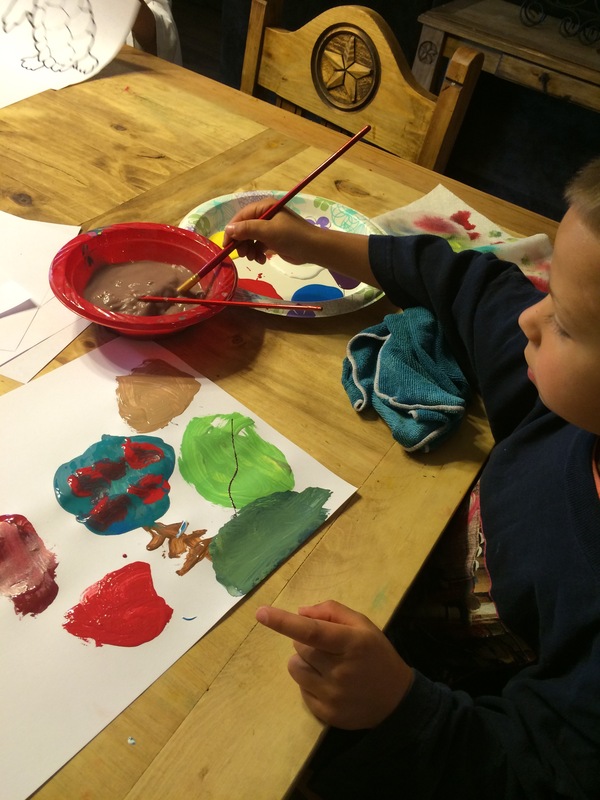 I miss the days when my youngest and I would paint together. I used to get those flat canvas panels for him to paint on while I worked on a stretched canvas. Yay art! Yes my husband bought me a fold up easel with an entire brush and paint set that all folds up into it and I can go anywhere. Love it. I used to do the brown packing paper too (recycling from boxes received in mail)… then bought a cheap roll of it.. we’ve actually event painted directly on it. There were many years I spent half -dressed, because I wouldn’t have time to put on pants and just a shirt and I was off and running. Fantastic, I love what they have done with their sea creatures, they look great! Next Next post: Real? Housewives?